Yesterday's action removed some short term options from the table, but has still left the pattern open to interpretation. It appears that I had Friday's decline labeled properly as an impulse wave, but that doesn't tell us with certainty whether that impulse was wave 1 or wave a. As I've been warning for a few days, I believe bears need to remain very cautious right now. I'm still quite leary of the (x) wave count. Below is the 1-minute chart, which shows the difficulty in nailing down a count with any certainty. Next is the 5-minute chart. 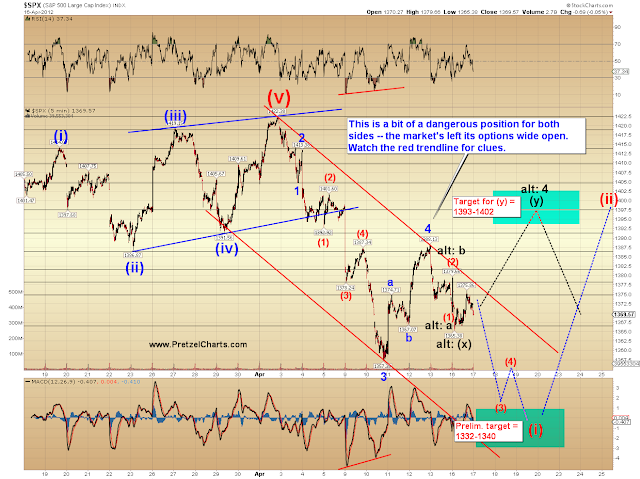 I'm almost equally split on the odds between wave 5-down having started, and the (x) wave count. The chart shows the expected outcomes of whichever count is correct. 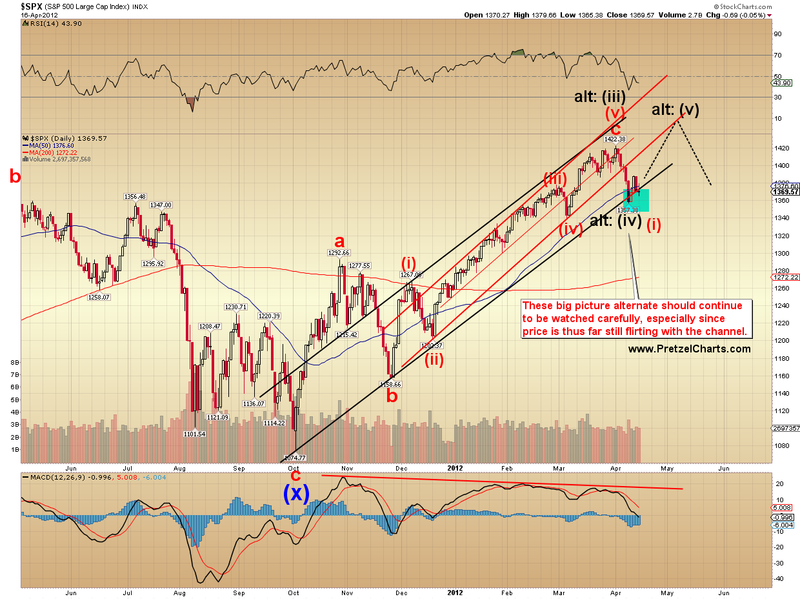 If the wave 4 label is correct, then the market should not sustain trade above the red trendline. If it does so, then suspect that the (x) wave count is playing out. And finally, the big picture alternate. It still remains possible that wave (iv) bottomed, though this seems decidedly less likely now that the 1367 price point has been overlapped and locked-in the view the the move from 1357-1388 appears to be a 3-wave form. I'm more worried about the (x) wave count -- especially since the extended fifth wave practically begs for that count to play out. In conclusion, I feel the market is in a somewhat dangerous position for traders who end up on the wrong side right now. There's some room to run in either direction, and there's little help from the market in sorting the impulse count from the (x) wave count. It's a tough enough call that I'm basically equally divided between the two counts. I've labeled the (x) wave as an alternate simply to sort each count out. Beyond that -- from my point of view, since I continue to believe this is the fifth and final subwave of wave (i) down, there should be a big bounce lurking in the shadows soon. The question is whether the market makes the wave (i) bottom directly, or runs up quite a bit higher first. 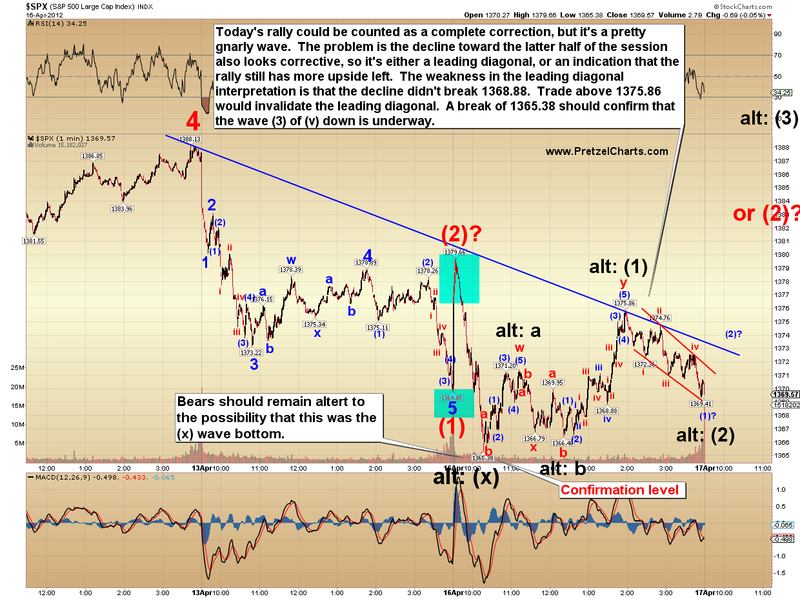 If the (x) wave plays out, I doubt bears want to hang on for dear life waiting for it to end. Trade safe. Not impossible, but I would assign a pretty low probability to it. See this chart. Been watching the $RUT for clues, watching the eur/$$ too. Need the eur/$$ to participate (a move down) and mrkts may have a good fall fairly soon (today?) locking us into a 3 down. MACD indicates the 3 is not nearly finished. Dollar's not in very good shape right now. Broken down from a head and shoulders and/or a triangle. It's backtesting the breakdown right now -- maybe dollar bulls can get something going there. I think RUT's a big tell there. Sorry 'bout the headache. My work related stuff finished up yesterday so will have some time now. You know what I do for a headache? I take a shot of vodka, works every time. and I am not a big drinker. Hope you feel better PL and thanks for all you do. Not on the count just posted directly above your post. watchin' for possible h&s on the eur/$$, if so mrkt will crash down hard after this sets in. Look at my $SPX/60 just posted, look at both minor an major threes. Perfect relationships, dojis where they should be, impulse candles in context with the counts. Look at the 20/50 MAs. PL, great work. I feel better about being so confused at this juncture;) Any thoughts what spx futures up 9 might mean to the market? enough to point to the short term bullish option? Sorry about that. I won't post links in the future. I won't make mention of other posts on other blogs in the future. You'll find that post near the top on Monday's April 16 E-Minis. You can also expand my profile and look at my recent activity. Once again, sorry about that - I didn't know that was prohibited here. Hope you get to feeling feeling better. I think a 61.8 retrace to 1398 would better harmonize with the behavior and personality of the markets in general over the last few years, when corrective retraces have been deep and frequently overshoot. And biased bears have had a way of jumping on the first formation that looked like an ABC and going short too early. Like I did in November. And the GDOW (which I believe reflects actual social mood better than heavily-influenced US markets) looks like it needs a lot more correction to look right. It hasn't even hit the 38.2 retrace yet. So even though I think surprises to the down side are certainly in store in the near future (more like stunning moves to the down side), I'm not going to be surprised if this correction isn't over yet. busted through 75.25, so no more ew5?? interesting thing is EURUSD seems to be stuck and not participating in the upmove in stocks...maybe the top for it is in like Katzo said, if it turns down, will equity follow? so it seems that the "black line" option is playing out in your second chart. CVX price movement at the open is not confirmed by oscillators, stochastics or True Strength Index. Looks like a continuation of wave four correction. this is what I am watching, ppl being too analytical with a break of my 75.25, candle wicks may not count. I think it's a bit too early to call that yet. By 10:05, another 15 minutes, it will be better defined. Your hint on Euro/$ was good! One could se the resistance it was facing at 1.314 ,,, 1 + pi/10. Descending triangle on SPX 1 min - break down hopefully means impulse down? Break up and new HOD I close puts. equity is rising disregarding the rise in Dollar, which one is bluffing? CVX...this C wave @ $103.07 is now equal to the a wave. Good morning Bob, any estimate target price for this correction? Look @ volume. This is short covering imo. Market is whipping the bears around before turning. I am not sure what to do. now we know the dollar was dead cat bounce, equity wins! BTW, The RUT KO level was hit on PL's chart, 810. At $103.67 this fourth wave correction will be 38.2% of the third wave down from $108.79 to $100.51. Quote of the day: "AAPL (after dividend announcement) is now like a CPA party crashed by a bunch of Hell's Angels." isn't 1383 a good target for c-wave? I don't feel like the market just pwned me... I feel like regulations just pwned me. I would have never had a position overnight if it weren't for day trading requirements. Protect the little guys? No. More like handcuff them. I hope you are right, I saw on Pl's chart from yesterday saying that above 810 bears are in trouble. Still gotta blame myself. Have to realize I have to miss many, many moves until I grow above 25K. Three trades a week it is for me - that way I don't feel obliged to hold overnight. Gotta pick them wisely. true. I'm considering switching to futures to avoid these gap opens. Gotta admit, I was thinking goin' short this morning 'til I read today's post from PL. The man knows his waves. Hope he is asleep! Vix is currently (10:40am EST) at 17.95. I don't see it closing this "low" for the day. I see it to be over 18. I sold May 18 puts. I know, one can be 100% correct and get screwed by these moves. Timing is the important missing detail. I can't refute PL's charts. He and many others here know a lot more than I do about waves. My trade is based on my belief that by May's expiration date, VIX will be over strike of 18. That and time decay would cause these puts to devalue in my favor as a seller. It’s amateur hour here at Cherek. It looks like alt4 on PL’s 2nd chart is in play. Is anyone going long here? not me. too much risk, too little reward. I'm going to wait for PL's blue box then short. PL you were 100% correct on your oversold call last week. I also have to add that the charts from PL and the AI Katzo7 has been impressive to say the least. I also love how so many in this community are contributing too. CVX....wave two correction $104.85 to $108.79 took a total of 47 hours to complete. As of this hour, wave four is 24 hours in the making. I was short with a very small position on Friday. Then, with the wild open yesterday I added an even smaller short position. BUT, yesterday totally failed to produce the 5 waves down that I was expecting. And being fully aware of the tendency for the ghouls to go after the Max Pain money, I suddenly saw the more bullish case as a real likelihood. So I bailed out of that second tranche of short positions shortly after having entered it, with a relatively small loss. I then reversed that position by putting on a long hedge to protect my core short position. This morning, with that gap up I became totally convinced that they're going after the Max Pain levels by Friday. Those would be 139 on SPY and 82 on IWM. So I bailed out of the core short position with another small loss and have recovered both losses with the long hedge. So now I'm long with a small position that was very lucrative percentage wise... but small. So after all is said and done, I think I'm positioned correctly, mostly in cash and have gotten out of trouble and into the green. None of this could have happened had I not been able to recently cure my disease. That disease was being hard-headedly bearish because of my understanding of why a deflationary collapse is not only possible but inevitable. The problem is that JP Morgan refuses to answer my email question about "when are you going to allow it?" So with every red candle on an hourly chart I think "this is it". My own indicators and my own TA work has often told me to go long. I ignored it. That is a disease. I'm happy to report that I'm cured. I've been bearish since 1974. So I am absolutely wide open to the idea that Pretzel's third chart showing the alt. to a new local high is a very real possibility. The market internals are actually getting oversold to a certain extent and I think they could support that idea. However, I sure have my eye on this possibility too. In fact, for the moment this is what I'm planning on until proven otherwise. It is only speculation at this point but by golly it sure works with the max pain theory. I might have missed it, but do you have a target for the end of the 4th? I'm learning and I am obviously missing the discipline aspect of trading. Does anyone have a recommended book/reading on day trading discipline, rules, etc? I had some great gains over the last 24 hrs and have given them all back and a lot more. I'm still long TZA, and June SPY 142 puts. So I'm stuck now trying to decide if I should take my losses or hold on. Not looking for trading advice but I am curious what some of you would do or are doing? SPX is officially in an xy move? And thanks for the chart on RUT! ideally go into every trade with a defined exit level in the market. EW invalidation levels -- "if we trade above 13xx level my count is wrong so i will close out"
VIX is having a challenging time getting below it's day high of 17.71. For this surge on the DOW and SPX, the VIX does not seem to want to move much lower. The May 16 strike 18 Puts are having difficulty getting breaking its high of 1.25 too. I think this might be the low for the VIX today. With the inverse relationship to the SPX, this might mean this is the high of the day for the SPX as well. However, I could be wrong when 2:15pm EST comes a long. Any chance CVX is doing what PL said over the weekend " could be an extended wave of 1-- and not a nested 3rd-- but if it is still wave 1 then it will probably bounce back towards 105" sure looks like this is what is happening? The Disciplined Trader: Developing Winning Attitudes by Mark Douglas. You can pick it up on Amazon for the commission of an options trade. Read it carefully, I think I re-read twice to allow it to sink in. No counter-indications against xy, IMO. I certainly have nothing on PL....but in my humble analysis, if the 38.2% retracement (right here) holds and turns down, then CVX is headed for $98 or lower. If CVX continues up from here.....then just call me "the nowhere man" cuz I won't know where I'm at....you know, "a thousand miles from nowhere"
That would be a beauty eh! Been waiting for that one to come into play. Thought it might not happen. Always appreciate your insights AR. Clayton- Was that you who was a former Marine? Similar to what DustDevil was saying this morning about being able to see a more defined market direction around 10:05am, my observation is the same for 2:15pm. I don't know the direction the market will take. I am just pointing out that around 2:15pm, the market will have a better indication of where it wants to go. Personally, I do not see it to go up much more based on today's news; because what old news still exist behind today's "good" news? Europe's old news is still there. Europe's issues were huge last week. What happened? Nothing happened. The issues are still there and ready to be used as news when the market wants to go lower. It has been a tough game for me personally for reasons that are in utter conflict with each other. First, I started studying stock markets, charting them, learning about Dow Theory and all that stuff at age 11. I had discovered a book at a small city library back then and became so incredibly interested in learning more that I just had to have that book. So I stole it. In any case, after blowing up a couple of accounts and all the while reading, learning, studying, creating my own TA, learning about market internals (which is the most important aspect IMO) and in only the past two years, writing, I think I'm finally ready to make some serious headway. It has only taken me 50 years. I have had a few successes in the past, on my best day profiting by $21,000. But I also learned how to lose it. Those were the most important lessons, and believe me I learned from them. Friends of mine on Seeking Alpha have been urging me to write a book for 3 years now. I scoffed at them because I didn't even know I had any writing skills. They did, but I didn't. So they urged me to at least write a few articles then, and again I scoffed. But eventually I started writing articles and much to my surprise, they seemed to grab a lot of attention for one reason or another. At the request of John Lounsbury I submitted 3 articles to Global Economic Intersection last year. I was just stunned to have seen this report last November revealing that all 3 of those articles had landed in their top 20 most read list. Somewhat bewildered, I came to the conclusion that maybe I could write that book on 'trading and investing' after all. I always 'have' wanted to write a comedy as well to be honest. But if I was to write that book, the first thing I'd tell you is to do just that... "overcome your pre-dispositions" as best you can. But I'd also advise you to "never" take your eye off the ball. It is good to be in the know. It is crucial to understand the bigger picture such as described in this incredible video by Chris Martenson. It first came out as a 3.75 hour "crash course", lol. But Chris has since reduced it in length and it is now only 45 minutes. I insist that you watch it, lol. If you want to watch the long version, just hit his homepage button. Stay the course my friend. Always keep some dry powder. I wish you the best and I'm on your side... as is everybody else on this blog including Mr. Twisted Pretzel. And just for the hell of it, here's the best "funny face" I've seen this year. Talk about trying 'a bit too hard', lol. Draw an Andrew's Fork off the $112.28 high and then the wave 1 low of $104.85 and the wave two high of $108.79. Top line is right where CVX price is right now. Will the +180, close +220/240 guideline play out today? You know...based on the current status of CVX...this is a great place to initiate a put or short trade. The wave 1 low was $104.85....that's your stop. Anything above that and we know wave it's wrong cuz wave fours can't overlap wave 1's. Also indicators are still showing weakness, as in non-confirmation. I heard you guys saying w2 was simple so w4 is going to be complicated... or something like that;-) does that also mean it'd take much longer to complete ? I'm thinking that from now until 2:15ish is when buyers are being lured in. After that, this surge will go back down to a more modest up day for the dow and spx that is more appropriate for today's news. it could, this rally really came out of nowhere. Semper Fi Brother. I'm a retired H-46 pilot. I lost a ton of $$$ earlier this year. If I would have known about this blog months ago, I would be much better off right now. I think you just have to be really selective about your entry points and not try to chase every potential opportunity. Lets face it you are a type A personality like me so there is no lack of confidence. What I am trying to do now is look for opportunities to maximize success especially since I am not as sophisticated as many on this site plus my airline sched may cause me to miss multiple days of watching the market. So major trend changes are good places to open positions. ie due to PL's predicton(plus many others) of the market making one more leg up plus the seasonality of tax season I thought tere was an opportinity to buy some calls for a short period. I may have missed the boat so I may have to wait until the market starts its next big leg down. But I am just tying to be real patient. There is going to be money to be made when we start back down in the few weeks or less. Regarding the KO for RUT: if this is in fact a wave 4 retracement and not the x-wave that PL warned us about, then theoretically it could go all the way to the end of wv.1 before the 5-wave count would be invalidated. That would 822.72 *not* that I'm suggesting that anyone hold on to TZA all the way to that level. Remember, that my rules, a hit of $INDU 180 then on to 220 are not set in stone and I have to real-time verify if the set up is there. Not every hit of a level will automatically kick in that observation. in this case I am gettin some divergence up here at +180 $INDU. does not look like a straight trip to 220. . .
PL answered my question yesterday in that if one correction is simple, does the next have to be complex. PL said that is a guideline, not a hard rule. But you are correct in your thinking. When one correction is deep and lengthy, typically the next will be shallow and short. Guideline...not a rule. I thought you already had 10 puts from Friday. Me too - 100sh at 103.74. I don't have any puts, though. Hey there bud. Glad you can put up with my thoughts from time to time... I'm just trying to contribute here and there. So you noticed the H&S possibility too then. Goodie. For sure partner that one would be a beauty. I'm trying to be careful though that I don't let that notion get in the way of my thinking about Pretzel's alternate. I don't think we get new highs personally, but I think it's safer that we keep that option in the back of our minds. Some moving averages, like the 6 day have rolled higher and that's kind of a bullish thing. On the other hand, the 12 day is headed solidly lower and based on prices of 12 days ago, it isn't going to be very easy to turn that one back up. So in combination, both of those facts support the H&S possibility rather than the prospect for new highs. But at this time, both are on the table. I just threw that in there as a gift... an apology for the long post, lol. Thanks to you and RichieMac for serving our country. Love the Marines! WS imo 822.72 should act as resistance for a day or two. Since that is what I am seeing and of the opinion that some fx repatriation will occur this afternoon I opened some 830/835 call spreads for 50 cents (credit spread). These are set to expire this Friday with the last day to trade being Thursday. I opened 15 contracts. I will close this position out on thursday unless the RUT goes back to 800. Then I will let them expire worthless. Not trading advice. I do.....but I don't think I'll make that back. Thanks trb. In my case though your "Not trading advice" is not necessary. I don't know enough about options to determine if you're banking on RUT exceeding 822.72 or breaking low against it. These days I've been trading TZA/TNA although I seem to jump from one to the other at exactly the wrong time. At this point in the afternoon, I'm wondering (or is it wishful thinking) that we hit the bottom of PL's blue box for the Y wave and make a hasty retreat. oh yeah....short it 1:00pm et.....LARGE ! The action is enough to knot your stomach, isn't it? Relentless rise is how I'd call it. We'll see. Question for you; what is a good place to reference the market internals you speak of? What specifically are you looking at that you feel has become the 'most important aspect'? Thanks, hoping to soak up all the useful info I can in order to be able to intelligently contribute in the future! I know someone who will be avoiding Chevron stations for a while! frannybrd...are you following CVX? Do you know when they report earnings next? I hope you are not going off "just" my comments. That's dangerous. I'm shorting here because of many technicals pointing the way. I have a tight stop at $105 (mental)....do you know why? What about that issue of seasonality that PL's friend discussed yesterday and how some the receipts from the end of tax season would find its way into the market. That support last year lasted much longer than a day or two. YW, it's just a possibility at this stage. I'm not totally convinced it's gonna happen but it's sure possible. So is PL's blue box (y) target of 1393-1402 is it there because the retracement level of 61.8% from 1422.38 to 1357.38 (which would make that w1, right?) is 1397.55? 1397.55 is is smack dab in the middle of that box Which would make this viewed as w2, right? I'm probably looking at it wrong, can someone say either way? Thanks. I use Chevron gasoline for my lawn mower. Hasn't run since 20 ot 1. Shoot, it don't look so bad! From a poster on another site. Q1 earnings is April 27-- fwiw upfront guidance should be higher than last Q. according to comments on Seeking Alpha. next push up on spx will fill the gap. Who knows? Could also be a big bull trap/bear shake and the big move starts on close? Be interesting to see. SPXA50R - That's StockCharts' symbol for percentage of stocks above their own 50 day moving average. There are so many more. But if you'd like one incredible resource for that kind of stuff, here's a link to the free StockCharts' Chart School. I think you'd find the section called "Technical Indicators and Overlays" to be most helpful. Most of the indicators I named are described in there. I knew about all these indicators since before StockCharts was even a website and I'm happy to report that they've got 'em all correct, lol. That's probably because they learned about them from the same guy I did, John Murphy, lol. In fact, he's probably the guy who wrote their Chart School. I do know that he's affiliated with them and still contributes articles. Thanks RickQC....I am aware of that time frame. DirtnRock guy posted that a couple days ago. I am most concerned about frannybrd taking a trade based on my comments. Was hoping that's not the only reason so I was querying franny to see why she took the trade. PL's post on 3/4 showed a chart of INDU with red and blue cycle boxes. It projected a cycle date towards the end of april. IMO this fits will a market top Friday/Monday with a Bradley top date.. Then we get the big move down. might want to change your username?? Your welcome. I agree with your 2:15 analogy. I have been watching the 2:30 mark for a few months now also. If the 180/220 rule comes into play what type of pullback usually follows that move? Are you considering application of the two up and short rule this late in the week? another ramp and camp day? the past hour has seen very little movement, deja vu again? One thing to note volatility is elevated even with this no movement, UVXY is at the same price as it was when spx was at 1383. Keep an eye out. OK....that makes me feel better...more worried about you losing money than me. I think I need some more aluminum foil. Dollar store here I come. Lordy TRB, if you got that kind of margin, why sell credit spreads? Just buy IWM outright and run covered call into expiration. You could earn more with less at risk? It'll be hard for it to retrace to 61.8% from the bottom of wave (a) today but more than likely it'll close at the high of the day which is EOD so wait until the point to short if you like to short - not now. Otherwise, it's a wave (c) or (3) up thus don't short it - it's hard but one should go long at every dip, that seems a reasonable way to trade today. It's also called a "garden day" since you can put in a trade and work on your backyard until the end of the day to collect your profits - you don't have to clue your eyes every second to your trading screen. No, you've got it right. He most likely used the fib of 61.8% as a good target. They're seldom hit exactly but they provide a reasonable amount of pullback. But most importantly, he's got it "below" the wave 1 of smaller degree which is indicated by the blue 1 (located at 1405). If price gets above that 1405 then we're looking at something more bullish when would probably bring his alt. count into play (in the next chart down). I'm no expert in all this but I'll give it shot ... I believe the XYZ is a corrective pattern, so Y would be followed by Z down (targeting 1340 ? ), which would then be labeled 1 followed by a bounce to 2.
another observation: anyone noticing the strange behaviour in bonds? Normally when the market goes up this much, the bond prices usually drop, but today it is not doing anything. Bonds are telling an entire different story than the equity. Who is right? Who is bluffing? Today is Ben's favourite kind of day. I had the very same disease AR...more expensive than my medical deductible. I'm a market agnostic now...I even sleep bet...cancel that...I don't sleep better. But I've been able to hold onto my dinero. Hope your doing well. Are oscillators arguing the case for Pretzel's doomsday (for bears) big picture alternate? I keep looking at the Stochastics, TSI, and the "Elliott Wave" oscillator on the daily chart of SPX and thinking maybe so. On the one hand, both Stochastics and TSI do suggest that the uptrend is getting mighty stale. Stochastics and TSI both show lower lows over a period of two months now and TSI's got lower highs to go with them. On the other hand, we've also got full metal reset on both TSI and Stochastic, with both having now crossed up solidly through their oversold and MA signal lines. This would typically suggest at that another trip north might be in the offing, at least in the short term. EWO is nothing in the world but MACD done on a 5- and 35-day simple moving average (rather than a 12 and 26-day EMA), which the author of Advanced GET found would dip through or at least tag the 0 line 90-something % of the time during a wave 4. On the daily SPX chart the last time it did that was back in December. 90+% reliability is not 100 of course, but it strikes me as pretty long odds to be betting against. Extremely so and 90% of it is upvolume. What's really got me on the alert at the moment is this chart>/a>. It's showing total upvolume 'minus' total down volume. IOW, net up volume. It's the divergence shown on this chart that is flashing a huge bearish warning. Just something to take notice of. It means the rally we're currently looking at is as phony as a 3 dollar bill. Doesn't mean it can't just keep climbing, but as the chart shows, that isn't likely. Also, for what it's worth, on the Russell, the up-leg we are currently in is identical to the bounce off the low of April 10, both in size of the bounce 'and' the angle of ascent... identical. IOW, wave a =c (almost exactly). Lol. That struck me as almost 'changing the topic' mid-sentence. And I need a new battery for my car. Looks like INDU just made wv 'e' of a 4th wv triangle, so should thrust up, then BOOM down. Problem is, will that be today or tomorrow? It is difficult to say. VIX is refusing to go lower. To me, this means that people want protection; and people want protection when they expect a drop. I am still leaning towards a decline of the DOW and SPX (not negative but a decline from the HOD) before the end of today. I've been watching that too, mostly looking for a dip in TLT to enter on. I and given to understand that stocks and bonds rising together is supposed to be a sign of strength in the market with plenty of money flowing in to go around, whereas equities dropping as bonds go up is generally read as a sign of more uncertainty and a flight to safety. But these days who the hell knows. back to 180 ish then up to the 220 to 240? AAPL calls are doing great today! The move today is too strong, making me wonder if AAPL can keep this up through earnings annoucement. Also think that there will be a rotation out of AAPL after earnings unless AAPL has a sensational quarter. FOMC meeting comes the day after AAPL announcement. We'll see how market and AAPL react to that! just a thought, quite a few people seem to want to wait till tomorrow to short at a higher price, is it possible we will end up having a big gap down tomorrow so most who wants to short will miss the boat? Market axiom...."Better to be out of the market wishing you were in, then in the market wishing you were out"
That is a good point about market in motion usually staying in that type of motion. INDU 4th wv? Looks like, been boring for 3 hours more or less flat, perking up now..
What is confusing is that DOW and SPX has been sideways since about 12:30.
of course it's possible, but I've learned to trust the blue box.